The Ohio Credit Union League just received a hand-delivered letter from Sen. Sherrod Brown (D-Ohio) in support of the tax exemption. 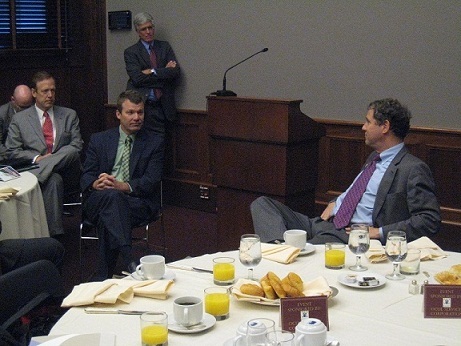 From left, CUNA President Bill Cheney; Tim Boellner (seated) CEO of AurGroup Financial Credit Union and chair of the Ohio Credit Union League; John Florian, (standing) vice president of Government Affairs for the Ohio Credit Union League; Sen. Sherrod Brown (D-Ohio). The Ohio Credit Union League gained one for the industry team, receiving a hand-delivered letter from Sen. Sherrod Brown (D-Ohio) that voiced his formal support for maintaining credit unions’ tax-exempt status.